Centering around two young men having tragically lost what rooted them together in what feels like a post apocalyptic alien infused world, one is later heroic and attempts to save their bloodline in an atmosphere where no one has any true free will. 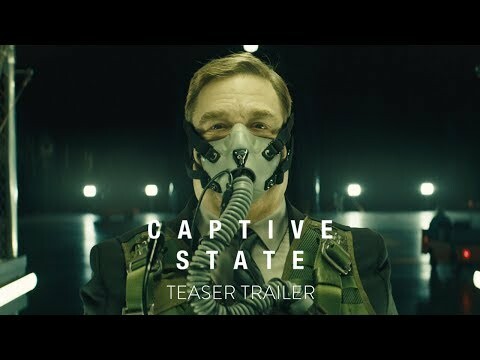 Be prepared to pay lots of attention while watching Captive State because the movie is no way is in short of displaying a new character after character after character, which if you’re not paying real attention, when they come back to screen, you’ll be easily confused as to their role in the resistance factor. Although not action infused, with exception to a nail biting car scene, the movie is more cerebral and atmospheric and accomplishes it quite eloquently. Its worth a view and a nod for its presentation of what life could be like if aliens were to take over this place we called home, the world. Lastly, the magnificent soundtrack suits the movie like a well fitted glove. Thumbs up!